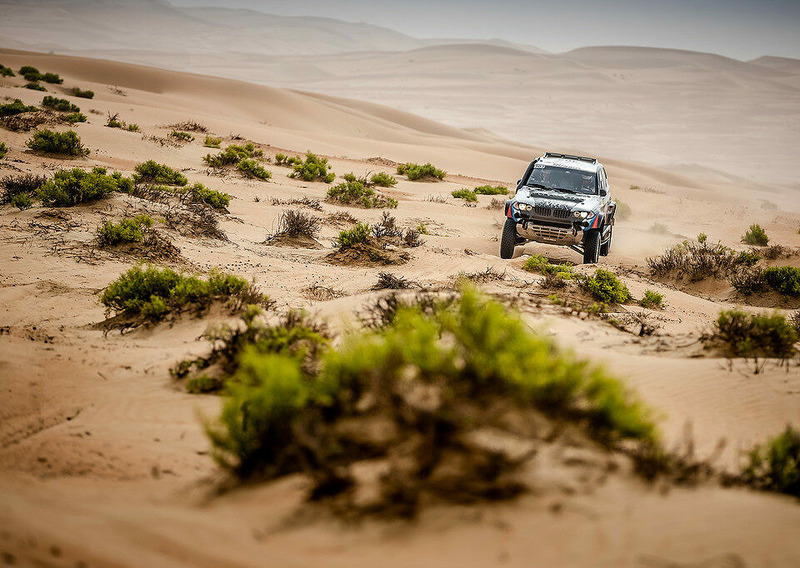 During the third stage of the five-day Abu Dhabi Desert Challenge (2019 ADDC) the participants overcame 298 kilometers of high-speed tracks along the sands. The third leg and the third crew that has set the fastest time of passing the distance – the Polish driver Jakub Przygonski has shown the best result at the finish today; he has spent 3 hours and 48 minutes driving through the sand and dunes in his MINI John Cooper Works Buggy. Unlike the previous two days, the weather has been comfortable today; the temperature in the shade did not exceed +28°C that cannot be said about the sands – the air temperature is perceived completely differently there. Today Vladimir Vasilyev has confidently led his BMW X3 CC to the finish, but fell into one of the sand traps – a funnel that is not so easy and fast to escape. Since the dunes are rather challenging, there are times when one crew cannot get out of such a sand trap without assistance. Precious time was rapidly passing, but Aron Domzala came to the aid of the crew in the Toyota Hilux Overdrive; he was able to pull out the Russians car. After these maneuvers problems with the engine overheating arose again and Vasilyev / Zhiltsov crew reached the finish line, reducing the pace and allowing the engine to cool. In the day results statement the Russians are on the eighth line, but it did not affect the general intermediate classification greatly – the crew in the BMW X3 SS lost only one position, dropping to the seventh place. Vladimir Vasilyev, driver, “Today we have got into the funnel the same way as we did in 2017 – I broke my back then, having “flown” into such a trap at speed. When you go first, you most often see traces of motorcyclists, they circle such places on the left or on the right. And in the car, when you cross the dune, the main thing is to choose the right course. Literally a meter to the left or to the right and there is no funnel, you can pass it. We crossed the dune and there was not even a second to drive aside, we got into it immediately. It’s good that Aron Domzala came to our rescue, although by that time we had already lost about half an hour to get out. We were almost there, but he helped us reduce this time. Thank him for that”. Many racers have tested out their character today; and Martin Prokop had to test the limits of his body – the driver still feels unwell and suffers illness “on his feet”, or rather driving. Bernhard ten Brinke started the special stage not meeting anyone along the way, but soon he caught up with Yazeed Al-Rajhi, who has had technical problems today. And then ten Brinke also experienced troubles – he punctured a tyre at one of the speed sections, but after replacing the wheel the crew “caught” the puncture again after just ten kilometers. Aron Domzala, who helped Vladimir Vasilyev, reported at the finish line that it was not his day, as he was also stuck in the sand twice; and the second time, hitting a funnel, the driver managed to damage the left front part of the car, but reached the finish line. In the previous days Cyril Despres experienced different technical problems, such as drive failure, oil loss, and a broken steering rack damper. Today the Frenchman has been finally able to finish without any mechanical damage. Tomorrow the crews will face the most difficult and long-lasting leg of a multi-day desert competition – a 520 km-long route, 286 of which will fall on the special stage.